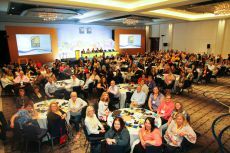 More than 300 UFCW members, officers, staff, and community allies from across the continent recently gathered in Vancouver, B.C. for the 12th Biennial UFCW Women’s Network Convention. The theme of this year’s convention was Turning Passion into Action. The UFCW Women’s Network focuses on motivating and encouraging UFCW women to become more active in their union and their communities across Canada and the United States. Delegates at this year’s convention were welcomed with opening remarks by UFCW Women’s Network International Chair Rhonda Nelson; UFCW Canada National President Paul Meinema; and UFCW International Secretary Treasurer Esther López. Alberta Premier Rachel Notley also delivered a message of solidarity via video from Alberta. UFCW International Vice President and Director of the Civil Rights and Community Action Department Robin Williams also presented the results of the AFL-CIO Working Women Survey, which detailed the need for better scheduling policies and other attention to issues that are affecting women in the workforce today. The UFCW Women’s Network aims to empower women through leadership training and mentoring, while encouraging UFCW women to actively participate to a bring a stronger voice at the bargaining table, in organizing campaigns, and in the political arena. To learn more about the UFCW Women’s Network, click here.